FYI! Bella Figura annual letterpress sample sale is here! 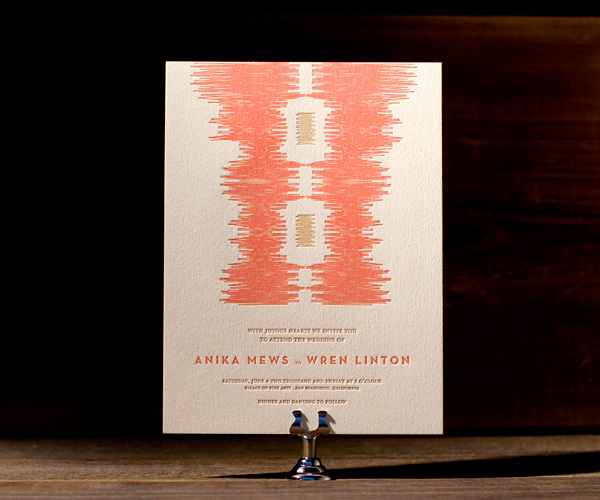 Now through October 8, all letterpress wedding invitation samples are on sale for just $1 each. There are over 300 designs available in our collection, with styles ranging from vintage to modern to traditional along with everything in between! And for every sample purchased, they plant a tree with American Forests. 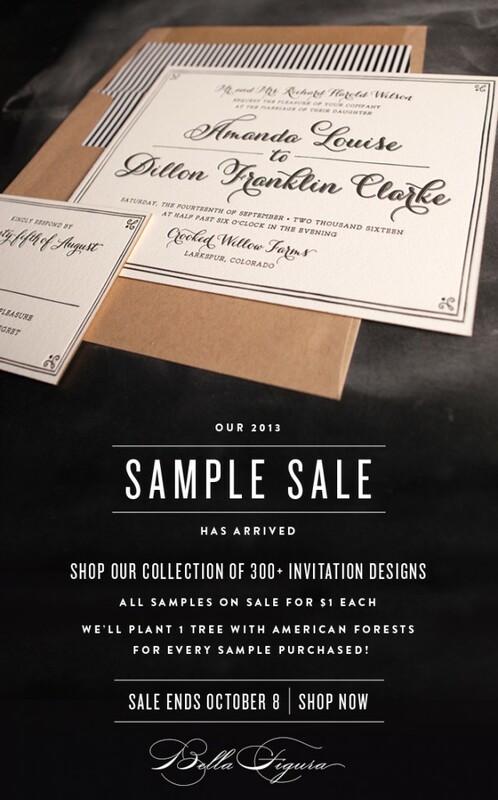 We planted over 2,000 trees after last year’s sample sale — help us plant even more in 2013 and shop now! 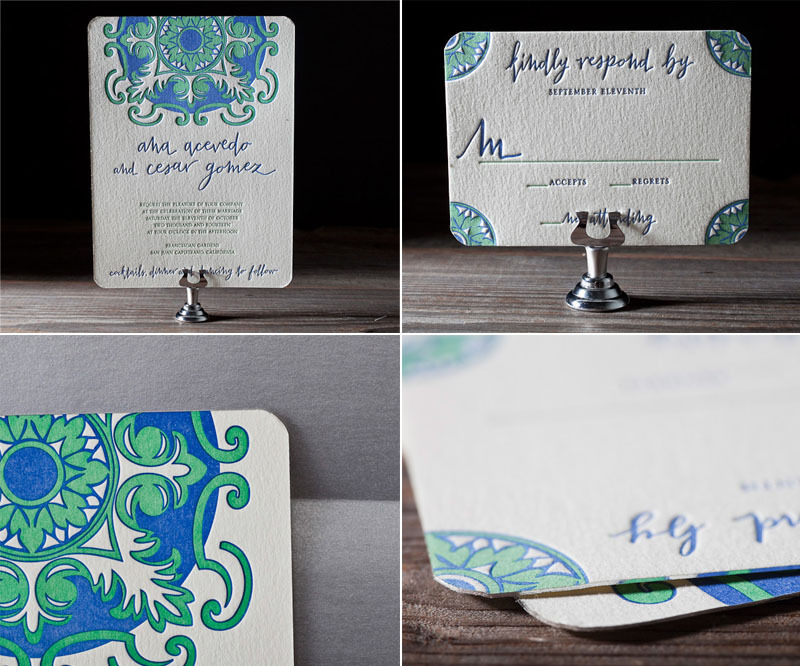 Bella Figura – Do Good in March for a Chance to win Free Wedding Invitations! Hi Guys! Hope spring is treating everyone well. I wanted to share this great giveaway by Bella Figura! If you loved our Pinterest contest last month, wait til you see what we’ve got in store for March! We want to see what good means to you: is it volunteering at an animal shelter? Planting trees? Donating to your local food pantry? Building homes for the less fortunate? Whatever it is, we want you to tell us about it and show us how you’re making a difference — and we’ll give you 25 free invitation sets* just for doing your good deed! It gets better: for the grand prize, we’ll give an entire set of free invitations to the person who submits the ultimate good deed. No purchase is necessary to participate, and the contest is open to everybody worldwide! *25 free invitation sets when you order 50 or more. Deadline: Your good deed must be done during the month of March 2012. Good deed submissions should be made by March 31 at midnight. Prizes: Everyone who follows the above guidelines and enters their good deed will receive a coupon and a unique code for 25 free invitation sets with the purchase of 50 or more. This promotional offer is valid through July 31, 2012. “Invitation sets” includes the invitation, reply card + envelope or reply postcard, invitation envelopes, and any coordinating embellishments (this includes envelope liners, edge painting, etc.). The grand prize consists of 100 1-ply, 1-color invitations, reply cards, and envelopes, and must be redeemed by October 31, 2012. The grand prize winner will be announced on April 16, 2012. 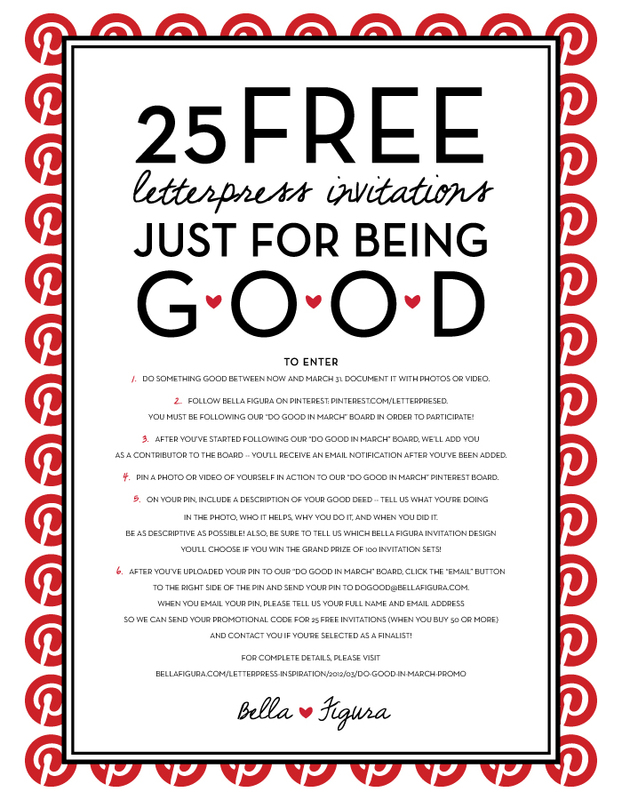 Criteria: You determine the definition of “do good.” For the free 25 invitation sets, anything you consider good will work. For the grand prize, we’re looking for actions that bring us hope; that demonstrate the power of an individual to do good; and that show us how the world can be a caring and beautiful place. In either case, please be sure to get a photo or video of yourself in action. Judging: The team at Bella Figura will choose the top 5 do-gooders and will post them to a finalists board on Pinterest by Wednesday, April 4. Everyone is encouraged to read about the five finalists on the Bella Figura blog from April 4 through April 11, and should “like” their favorite on Pinterest in order to cast a vote. The do-gooder with the most likes on Thursday, April 12 will win the set of 100 free invitations. You must have a Pinterest account in order to “like” one of the finalists, so if you need an invitation, email dogood@bellafigura.com and we’ll send you an invite right away. 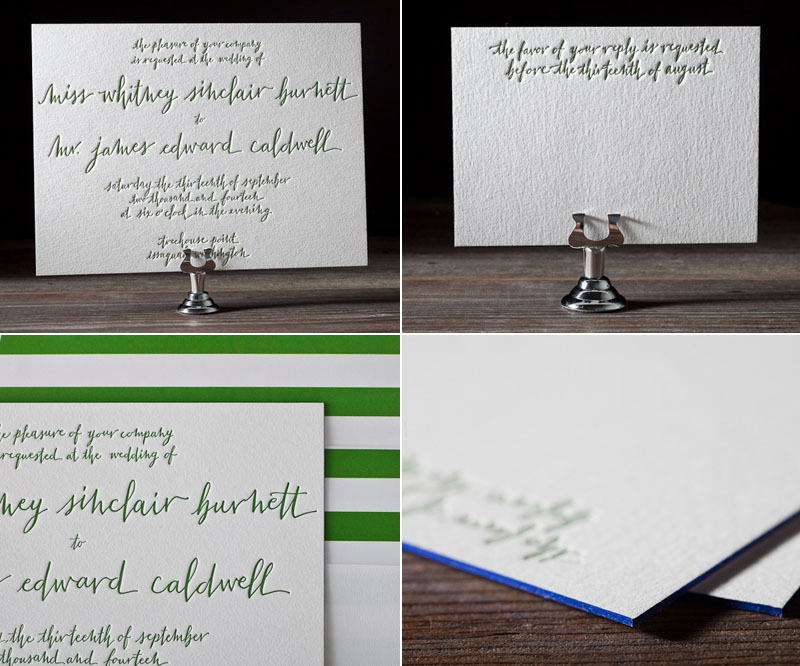 Bella Figura Calligrapher – New Designs Launch! Today I am finally allowed to announce something that has been in the making since….April! You are now looking at one of the newest calligraphers and designers for Bella Figura. Two of my original designs for the new year are up and can be found here and here. 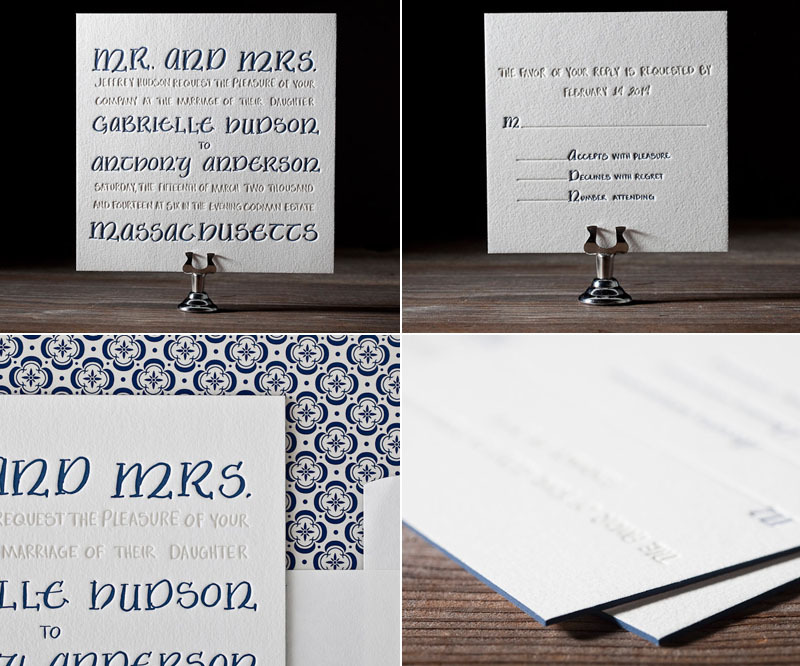 If you are not familiar with Bella Figura, they are a luxury letterpress and stationery company based out of Syracuse, New York who has a love for letterpress and a nice deep impression with punches of color and pushing the limits in options and combinations to their clients. And thank you to Style Me Pretty for a lovely announcement on the launch of the new collection! The silliness of bottled water seems to be on every one’s mind lately. I was talking to my sister yesterday about her new resolution to recycle her bottles of water that she drinks. This lead me to tell her how it consumes oil to make those bottles and if the water is so bad (it is, I smelled it the last and only time I was in her current town of residence) she should use a filter and a reusable water bottle. I would wax on this for some time, but today on Treehugger I found a cartoon by Steve Greenburg of the Ventura County Star on this exact same subject. because pictures are worth thousands of words, I am sharing it with you today from his web-site Greenburg-art . give it some thought. I can’t share the picture b/c it is copywritten and I didn’t prepare a head of time for today’s post, sorry, click the link to see it on treehugger!